Some graphs are easy to make and interpret, some are hard to make but easy to interpret, and some graphs are tricky to make and even trickier to interpret. But you can never get too much practice. 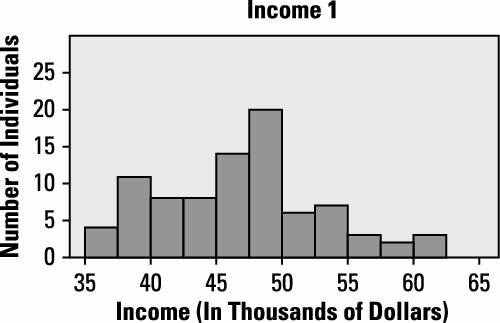 The following three histograms represent reported annual incomes, in thousands of dollars, from samples of 100 individuals from three professions; call the different incomes Income 1, Income 2, and Income 3. 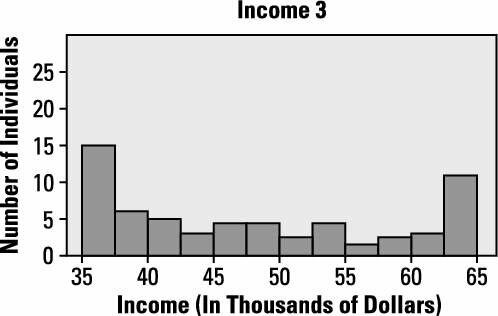 How would you describe the approximate shape of these distributions (Income 1, Income 2, and Income 3)? Income 1 has the bell shape of a normal distribution. Income 2 has a roughly flat shape. 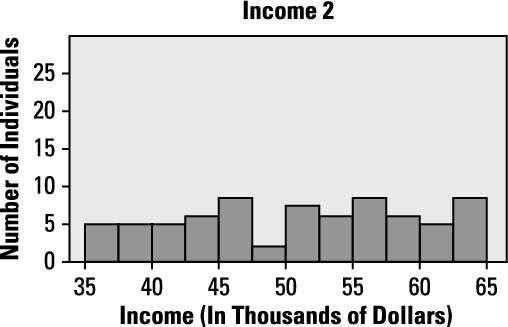 Income 3 has two peaks in it and is bimodal. All three samples have the same range, from $35,000 to $65,000, but they differ in variability. Put the incomes of these three professions in order in terms of their variability, from largest to smallest, using their graphs. Because you measure variability in terms of average distance from the mean, graphs with values more concentrated around the mean (such as the bell shape) have less variability than graphs with values not concentrated around the mean (like the uniform).